Joan (owner of Sweetscentsa) is always very generous with samples. Every time we order, we get several of them. This time I’ll combine three samples from previous order I find suitable for spring/summer time. 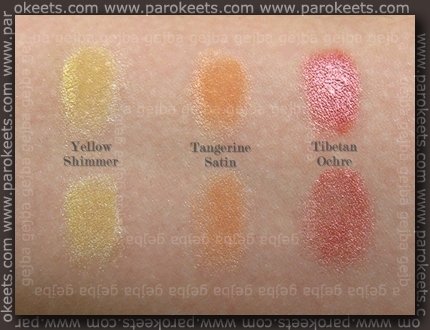 I chose: Yellow Shimmer, Tangerine Satin and Tibetan Ochre. In top line I applied pigments over Coastal Scents Eye Poxy primer and in bottom line I used, well, nothing. 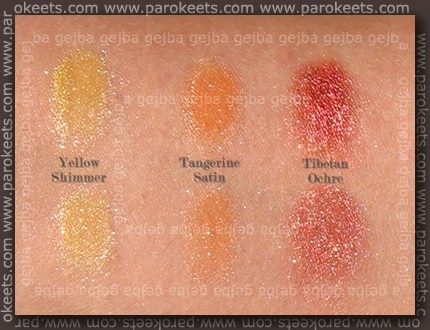 Yellow Shimmer is the most shimmery eyeshadow in the lot. It has yellow base, sprinkled with diamond colored dust. 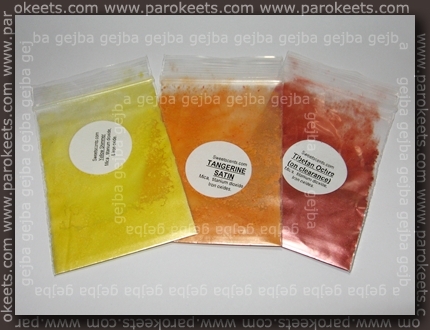 Tangerine Satin has the same shimmer at Yellow Shimmer, just less of it. I was very impressed with this shade and will be ordering it at first opportunity. It glides on and it’s my kind of orange – not to bold. 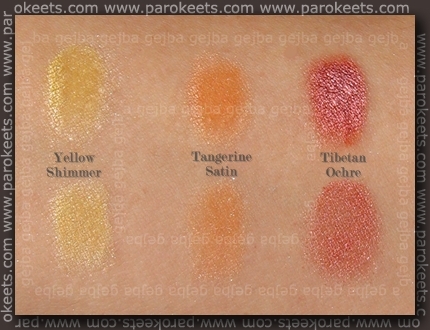 Tibetan Ochre is more pigmented than previous two eyeshadows but has very similar shimmer.This is had color to describe. Closes thing I have is copper color with splash of burgundy. Very interesting color. Finally sun showed up in all its glory so I made one more picture to show you the shimmer. Do you agree that these eyeshadows are perfect for summer? I’ll try to take pictures under different light next time. I love those three pigments. They look perfect for the summer. Will you do a FOTD? Sploh Tangerine je :stars: . Bi ti napisala pod privat, ampak ne vem kako se naredi… D:! Btw vsem ki imajo blogger deluje komentiranje na moji strani.. D:!! Kriza. Drugace pa lahko komentiras tudi v cbox, itak ga cekiram vsak dan ;). Jaaaa! Btw tale tvoj napis izgleda kot tatu na kozi! ;) – imena senck!